“See, such great things are contained in these seemingly unimportant words, ‘Behold, thy king.’ Such boundless gifts are brought by this poor and despised king. All this reason does not understand, nor nature comprehend, but faith alone does. Therefore, he is called your king; yours, who are vexed and harassed by sin, Satan, death and hell, the flesh, and the world, so that you may be governed and directed in the grace, in the spirit, in life, in heaven, in God” (5). “This is what is meant by ‘Thy king cometh.’ You do not seek him, but he seeks you. You do not find him, he finds you” (7). “If, here upon earth, the body is unwilling, not capable of grace and Christ’s leading, it must bear the Spirit, upon which Christ rides, who trains it and leads it along by the power of grace, received through Christ. The colt, ridden by Christ, upon which no one ever rode, is the willing spirit, whom no one before could make willing, tame, or ready, save Christ by his grace” (28). “Faith receives the good works of Christ; love bestows good works on our neighbor” (71). “Through the Gospel this light is brought to us, not from a distance, nor do we need to go far to obtain it; it is very near us and shines in our hearts” (135). 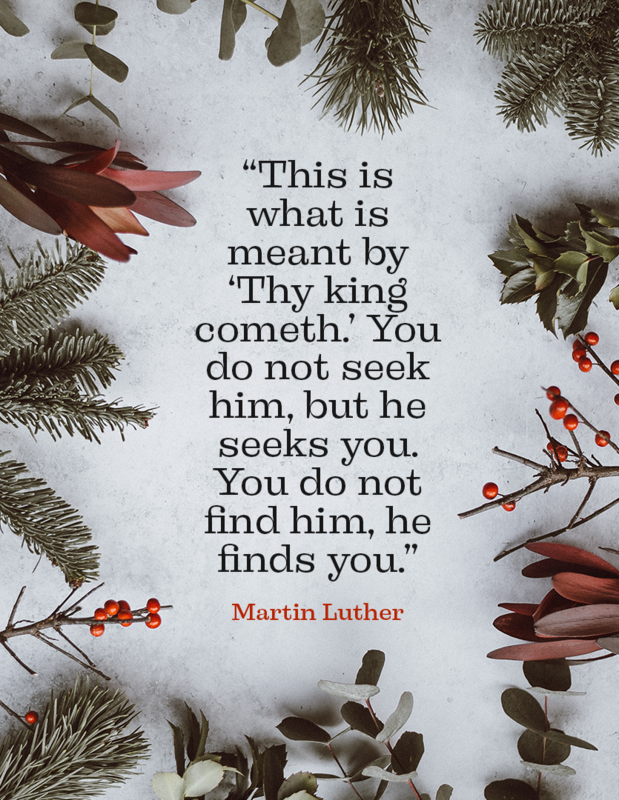 For more information about Martin Luther’s Sermons for Advent and Christmas, visit our website! To read some of Charles Spurgeon’s best quotes about Christmas, check out this post!